Well, I went. I did. I conquered. Not exactly how I planned for it to go down but seriously, it’s an Ironman and you can’t predict your race no matter how hard you try so you go with it… and go with it is exactly what I did. We arrived on Thursday after stopping on our way north to get my ride at Bicycle Speed Shop and picking my parents up at the airport. The Westin got us right in and it was awesome! We were in the mix of things and there was nothing to worry about. 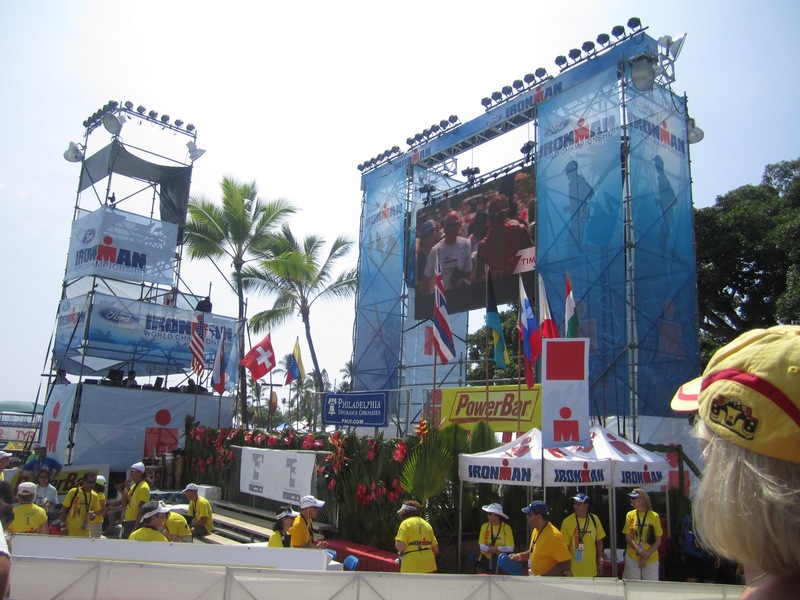 I checked in relatively quickly at Ironman Village and then headed back to the room to get my bags and bike set up. I ended up having a pasta dish at Grotto that evening and went back, hung out with the parents, and headed off to sleep for the night. Friday morning, was swim practice. Brent, one of my friends, joined me for the swim. It was his first Ironman so it was cool seeing him and going through the motions with a newbie! It’s also fun when you randomly run into teammates that you haven’t met in person yet, yea, I’m talking about you Katie Waters! I headed out for the swim, I was content. I did a little more than what Coach Lesley told me to do but only by a couple hundred extra yards. I felt good. I was ready. Next up, big breakfast at Another Broken Egg… yes, please! Dustin playing security! Thanks Tomas for the picture! Brent and me on our way to swim practice! We went back, got the bikes racked, T bags dropped off and made a quick stop at HEB before heading back to relax. A little Moxie flare to help me see my bag better! Friday night, we had some team obligations to attend. This year, Moxie Multisport partnered up with More than Sport and CeramicSpeed for our annual happy hour fundraising event. It was held at Crush on the rooftop – it’s kind of awesome when your parents get a room that overlooks the event! This was of course sponsored by the great folks of Blue Nectar Tequila – next year, I plan on having more than one of those margaritas! (but more on that later) I left early so I could get in bed and ready for the next day because we had a little thing like Ironman Texas. RACE DAY: The next morning started smooth. I only forgot a bike pump. No biggy, I can borrow someones. Got to the new T1 and made sure everything was in order. Dropped off special needs bags and it was time to see the family before the race. Dustin was volunteering as a medical peep at Swim Exit so I got to see him for a minute longer. I felt good all morning. Swim: I typically cry before it begins and not this year… miracles do happen! Water was 81 degrees. I had to pee so bad and I tried at the turn around but it just didn’t happen! A fog rolled in as I was swimming back. That makes sighting a little difficult but I kept on going. My garmin said I swam over 4700 yards with a 2:22 pace, I’ll take it! Even if I seemed to be on track most of the swim, it seemed a little long, oh well. T1: Went by fast, came out – grabbed my pretty ribboned bag and headed in. My handler was awesome! I told her no matter what I needed a Q-tip – I think she was shocked at the level of brown that came out of my ears! Arm coolers on, shoes on, helmet on, at my Nature’s Bakery Fig Bars (one in the tent, one on my way to my bike) and I was off feeling strong the whole way through! I was like yes! It’s gonna be a good day! Bike: I started out feeling really good, maybe it was that fig power, I’m not quite sure. One the east side of the course, I almost got hit as a result of a gentleman not paying attention to the Officer directing traffic on that particular intersection – it’s cool, I yelled “COME ONNNNN” at the driver while the Officer directed a profanity at him which I appreciated and it was not nearly as loud as my come on but it did tell me he wasn’t happy with the driver! 🙂 I really didn’t mind the turns, and I didn’t think the traffic was terrible. Sure we had a spot with exhaust but we always do on this course so it was what it was. Before I hit special needs though, I started feeling my knee aching. I stood up there to get more sunscreen and get my PB&J and go – I thought, oh it’s not to bad, I can run it out. Finished up the bike still feeling pretty good but I knew I could have done better. It was a little over 6 hours but it was the fastest I have gone at that distance in a while. Meanwhile, while I was out on the bike, Dustin and the Moxie gang was setting up Moxie Bridge! Short shorts, speedos, and bikinis – what more can athletes ask for?! T2: I thought I was quicker than that but I guess I wasn’t. My feet were on fire since I left my shoes on my bike and I couldn’t run fast enough. Got in, got the arm coolers off, socks on, shoes on, handler thank you card and I was out! Run: It’s always nice coming out of the change tent and going down a short way to see someone waiting for you… Dustin ran back, told me to slow down, and after I got through the bridge, I let him know my knee was hurting but I thought I could loosen it up. I was having a great run when it started lightening, and raining, and then you’d hear thunder… and then it started raining heavier… then I came to a complete stop. In trees. Not exactly my ideal place to be in a storm. That gives you an idea… and then it hailed. I was trying to keep warm, pacing back and forth and I could feel the pain in the back of my knee increasing… uh oh. After a 42’ish minute delay in the race, I started walking with one of my teammates, Mark. I walked probably a half a mile and then attempted to run again… the back of my knee HURT! I started run/walking… it wasn’t pretty but I knew I had to get through a couple more loops and I had a goal time in mind. Unfortunately, the longer I went, the tighter it got and after a loop and a half, I started to call it to be more walking and then ALL walking… not knowing what was going on, I decided to error on the side of caution. This may have been a tough decision but I really felt it was the right one. I finally got to the chute before 11:00pm – that’s cool, not planned but you know the saying, “Anything is Possible” and when you have a long distance like that, well, anything is possible! I ran just the chute and it hurt like hell… when I got there, I thought to myself, “Oh no, they’re already tearing everything down!” What I didn’t realize was how bad the finish line got destroyed in the storm. So much pain. I was focused on just hitting the line so I could hit my bed. Next up is Vineman 70.3 with the Moxie crew and I’m a little under 6 months out from Ironman Florida! Until then, I’ll be rehabbing this injury – back to pool running, etc. I think I’ll be okay to race Indian Creek in a couple weeks as a feeler and then we’ll take it from there. Thankfully the x-rays and ultrasound showed nothing major and best estimate is that it’s muscular. After crutches and a knee stabilizer for a week, I’m thankful to be on the mend!